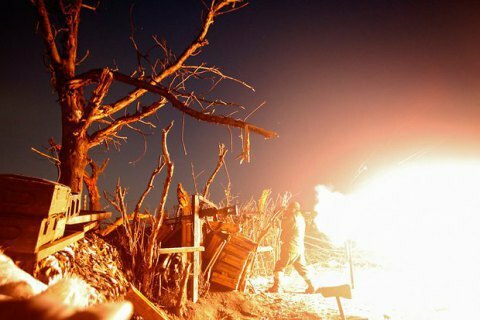 Militants have shelled ATO troops with 122mm artillery systems and 120mm mortars. Five Ukrainian servicemen were killed and six were wounded on Sunday in a battle in the area of Svitlodarsk bulge, ATO HQ reported on Sunday evening, 18 December . "Starting 5:50, in the area of Svitlodarsk bulge, after a long fire preparation with the use of heavy artillery and mortars, Russian-backed militants attempted to force our advanced units out from their positions. To this end, enemy forces tried in considerable numbers tried to implement a workaround of our positions. Enemy plans were exposed in time. In the ensuing battle the enemy efforts were thwarted during the two-hour battle. Our units troops caused defeated the adversary," the report said. Reconnaissance reports said about 20 militants were killed and 30 wounded. "Unfortunately, we have lost five soldiers, and six were wounded, of them two – got medium gravity wounds. All victims receive skilled medical care," reported the ATO headquarters. In the same day, Shyrokyno, Talakivka, Vodyane, Hnutove, Pavlopil, Maryinka and Novoaleksandrovka in Mariupol and Donetsk sectors were shelled by the enemy. Journalist Yuriy Butusov has reported with a reference to the command of a battalion of the 54th Brigade that the headquarters of the ATO may understate the losses. "According to unofficial reports – we had six dead Ukrainian soldiers and up to twenty-five wounded. A group of wounded soldiers are in the Dnipro Mechnikov hospital, doctors are fighting for their lives, " the journalist wrote on Facebook.